New car market rises 23.1% in second smallest month of the year, with 94,094 units registered. Demand for hybrid and plug-in cars surges 88.7% with record one in 12 buyers going electric. Year-to-date registrations down -4.2% keeping market on track to meet 2018 forecasts. The UK new car market enjoyed a boost in August, as year-on-year demand rose 23.1%, according to the latest figures published today by the Society of Motor Manufacturers and Traders (SMMT). 94,094 new cars were registered in the month as the market responded to regulatory changes, with cost-savvy buyers taking advantage of some compelling deals in what is always one of the year’s smallest months. Demand was up across the board, with consumers and fleets boosting year-on-year registrations by 23.3% and 19.7% respectively, while the smaller business sector rose 166.4%, equivalent to an uplift of around 1,500 units against August last year. Superminis remained the most popular buy, followed by small family and dual purpose cars, with the luxury saloon and city car segments recording the most notable growth, up 120.8% and 39.6%. Meanwhile, the UK’s growing range of hybrid, plug-in hybrid and pure electric cars continued to attract buyers, with a record one in 12 people choosing one.1 Demand surged by a substantial 88.7%, with the sector accounting for 8.0% of the market – its highest ever level – as billions of pounds of manufacturer investment help deliver more ultra-low and zero emission models to the market. In the year to date, the overall market remains down by -4.2%, in line with forecasts after a turbulent first eight months. However, demand remains at a high level with more than 1.5 million new cars featuring the latest in advanced safety, emissions and convenience technology joining British roads so far in 2018. It’s great to see such strong growth, particularly in the important electric vehicle market. 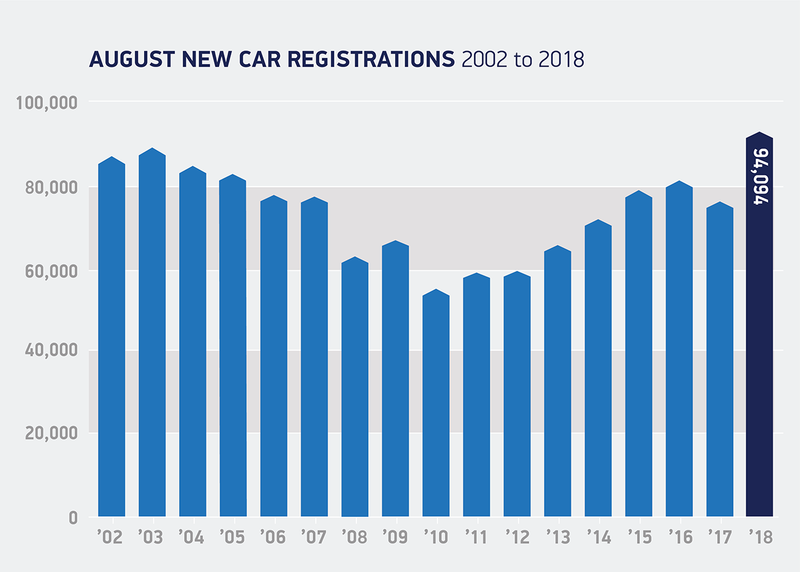 However, given August is always a small month in new car registrations ahead of the important plate-change month of September, it would be wrong to view the market as booming. Indeed, this past month has seen some significant variances as regulatory changes have disrupted some supplies. In the long term, however, the new emissions certification test will give consumers renewed confidence in the performance of all vehicles, helping them choose the latest, cleanest technology that best suits their driving needs, whether that be petrol, diesel, hybrid or plug-in.